Souls will be reaped rept harvested at BlizzCon this year, where willing ciphers will come forward to have the very essence of their being extracted at 300 PC demo stations. Their wispy, intangible cores will be used to power the auction house until its retirement in March. 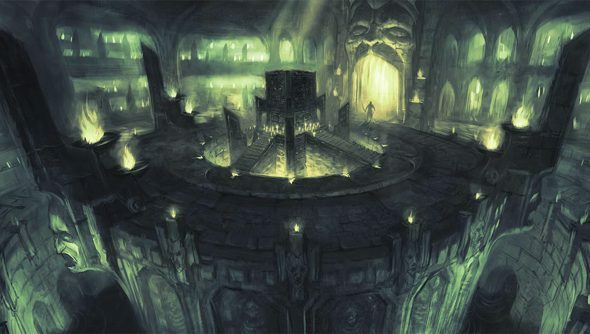 With any luck, those of us with a Virtual Ticket at home will also get a good look at Diablo III’s inaugural expansion. “Malthael, the Angel of Death, grows restless,” write Blizzard, never knowingly unmelodramatic. “Having sieged the historic city of Westmarch, he now sets his sights on a new metropolis: Anaheim, California—the great gamer haven of the West. The PC demo expected to take up residence in the Anaheim Convention Center on November 8 and 9 will take players to Westmarch, where they’ll hop into Nephalem Rifts – formerly Loot Runs – and fight in Adventure Mode, in which Blizzard cryptically promise “the world itself is your battlefield”. In the final release, Adventure Mode will be unlocked after completing Story Mode with any hero. All five of Diablo’s existing classes will be playable at the event, plus the new Crusader class – a mid-range melee specialist who combines weapons, spells and abilities to punishing effect. Also on display for the first time is Reaper of Souls’ PS4 version – intriguing, as Blizzard’s expansion team were devoted entirely to the PC as recently as August. The Virtual Tickets come with some 60 hours of HD panels, demos and cosplay guaranteed, but will set you back about $40. Split between two or three and projected on a wall all weekend, though, that doesn’t sound like a bad deal. Check Friday’s BlizzCon 2013 schedule post for our predictions on what to expect. Despite the demos, Diablo’s presence pales in comparison to that of WoW and the newly re-christened Blizzard All-Stars, Heroes of the Storm. What announcements are you hoping to hear?